Today we reviewed the goal of the Baker Buddy Program, our motto, and what teamwork looks like and sounds like. What is the Baker Buddy Program? The goal of the Baker Buddy program is to further develop a mentoring relationship between 6th grade students and 8th grade students in which all students continue working on becoming an individual, standing up for others, and learning from others. Teamwork – what does it mean to work as a team? Make sure that, even if someone can’t contribute, they are still included. Make an effort to get to know them. We reflected on our experience at Adventure Island and talked about how we can "Be a Buddy" to our 6th graders that join the Baker Buddy program. 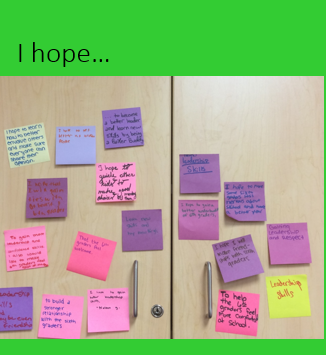 We finished with an "I hope" statement to set a goal for the year. What do you hope to gain by being a Baker Buddy Mentor? After watching this video, we added to our definition of teamwork; what it looks and sounds like.